We recently had a big going away party for a friend who was moving to Italy. We themed the party “Americana” to celebrate their time in the states. We decided to work out 4th of July collection into the shoot because the theme, colors and details worked so perfectly for any summer or 4th of July BBQ or party. 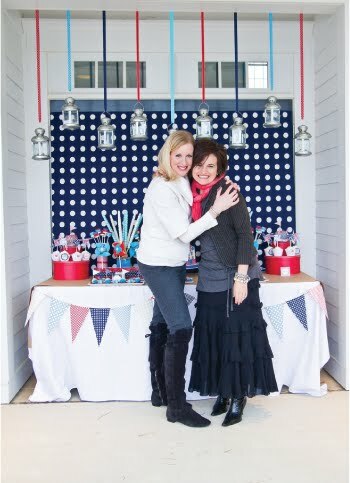 The party was held at the Village Hall in our community - a building that has classic white southern architecture. 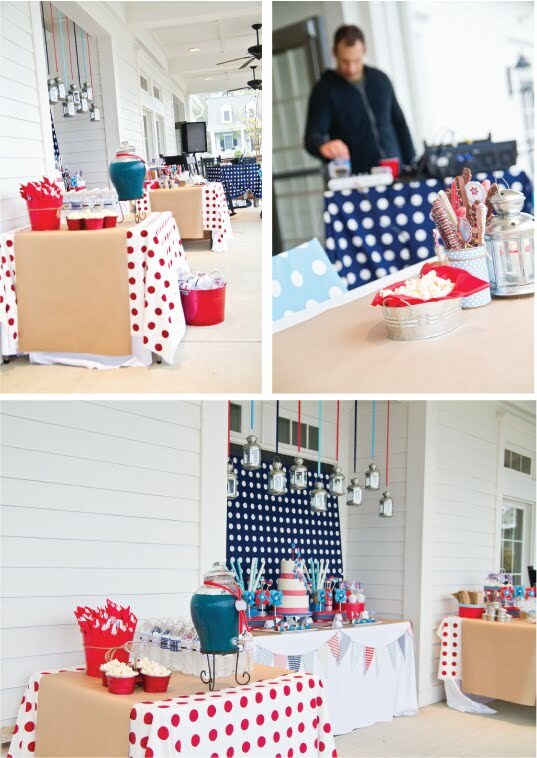 The white woodwork on the terrace was a beautiful backdrop to make our colors “pop”! 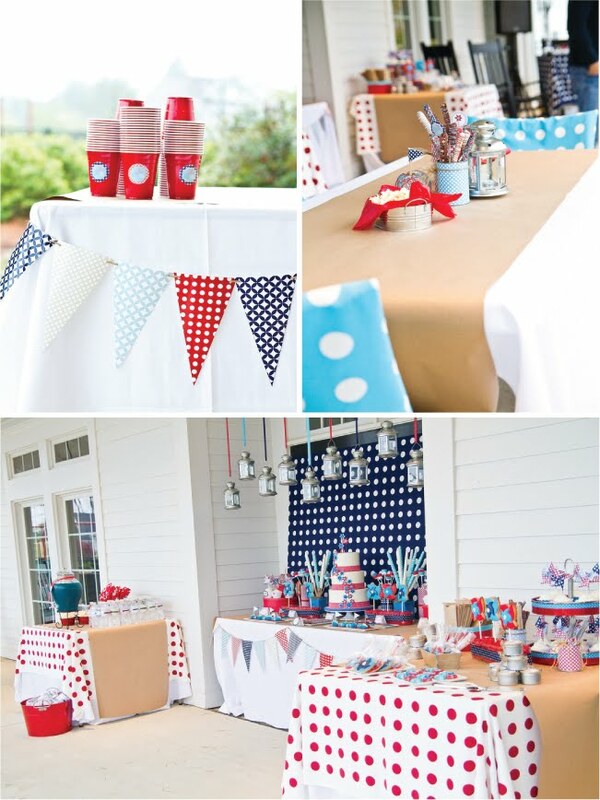 For the printable graphic accessories that embellish items throughout the party, we mixed in the traditional red, navy and white with some accents of aqua and kraft. Some of the graphics have a “distressed” feeling, making it feel like a classic American Fair. 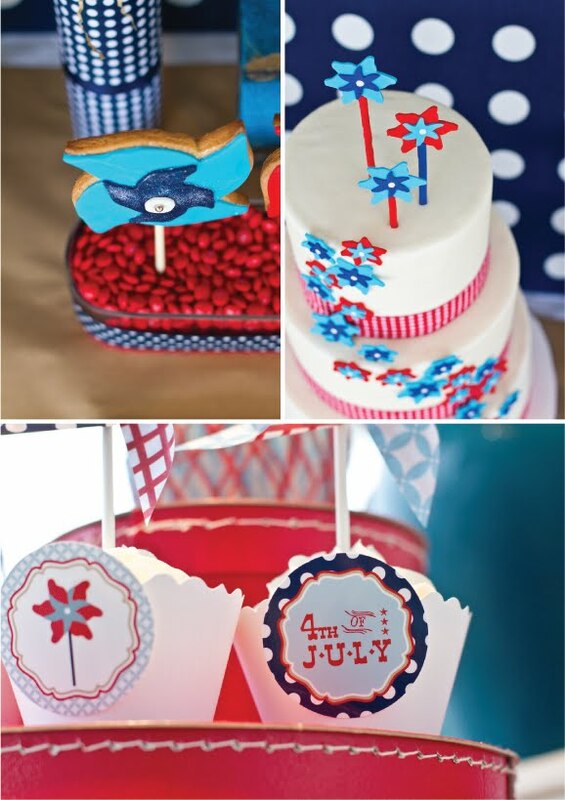 Pinwheels and firecrackers give off the vibe of summer and celebration. We mixed in modern patterns to give it a fresh feel. 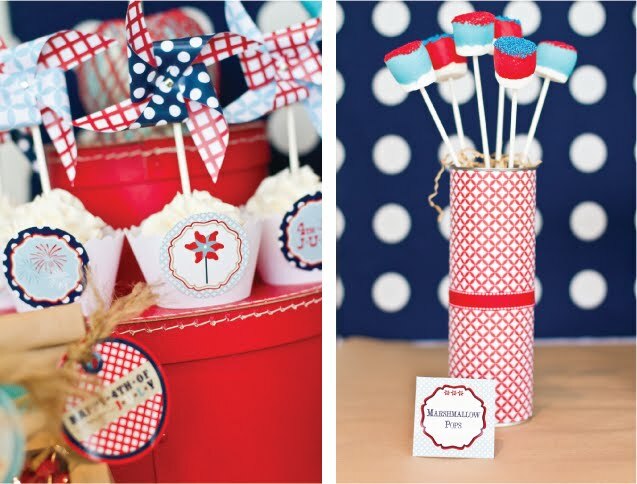 This collection was designed to be versatile for any summer BBQ or 4th of July celebration. 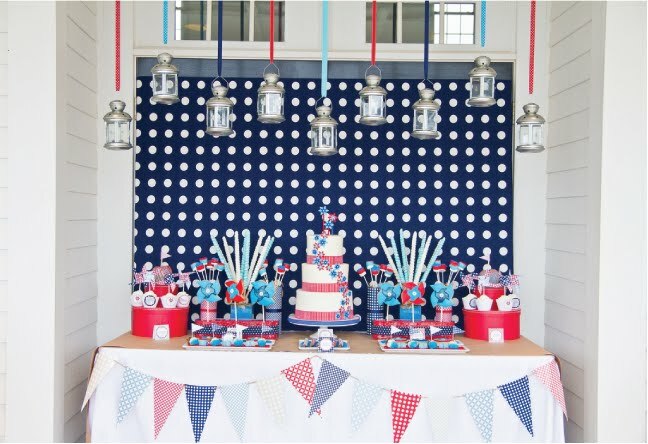 - A navy with white modern dot backdrop was paired with a classic white table cloth and a kraft paper (from Nashville Wraps) overlay to make it less “formal” and give off the vibe of a true american fair celebration. - Galvanized metal has a role throughout the entire party, but in small doses. 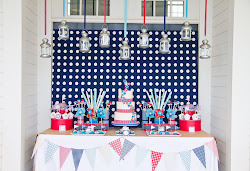 We hung galvanized metal lanterns from the ceiling above the dessert table. 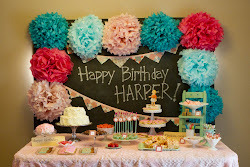 We used thick ribbon to hang these and pull in some color from the table below. 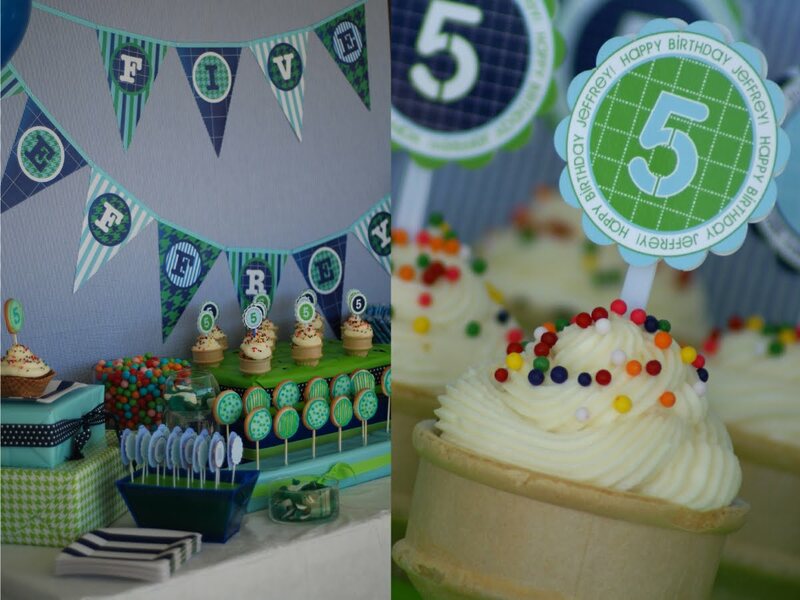 - The printable pennants from our collection were printed and strung with twine on the front of the dessert table. 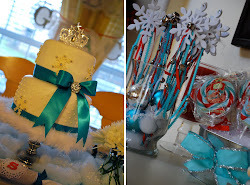 - The cake (by Mandie of Got What It cakes) was an amazing classic white butter cream cake that was tiered and loaded with bright pinwheel decor. A fat red and white gingham ribbon was wrapped around the base of each tier. 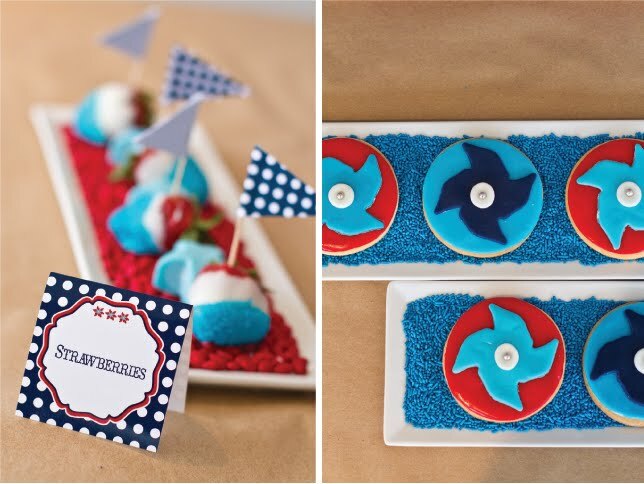 Fondant pinwheels were also stacked on the top of the cake as well. 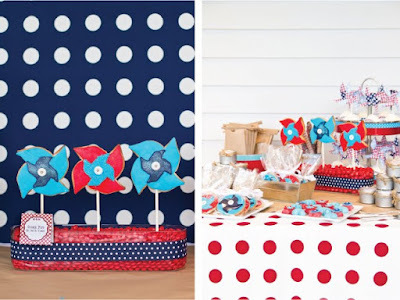 From a distance, the pinwheels have the feel of “fireworks” because of how they were staggered, but up close they were pinwheels to tie in with the theme. 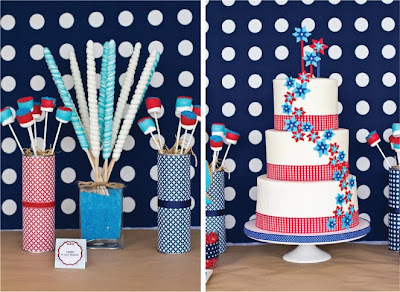 - On either side of the cake was a glass container filled with aqua sprinkles and a bouquet of unicorn pops in the aqua and white colors. We bunched the lollis together and used twine to tie them into a bunch. 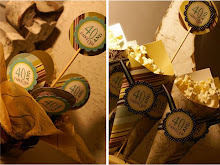 These were beautiful and they were packaged great because even after guests would one to enjoy, the twine kept the remaining bunched and still looking spectacular. 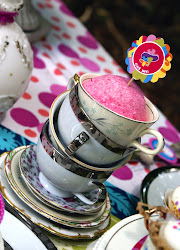 - In between the cake and the cupcakes, were staggered double stacked SOUP cans that we wrapped with printable patterned paper and embellished with ribbon. 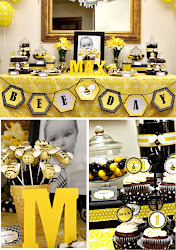 (Great DIY project!) 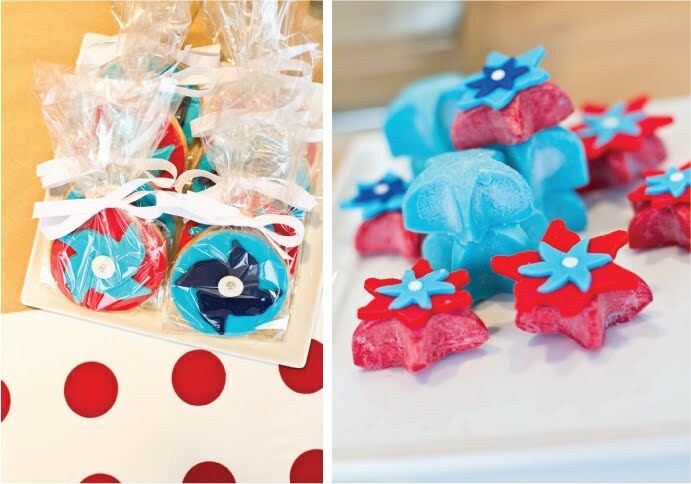 We made chocolate covered marshmallows in the red and aqua and white colors and dipped them partly in sanding sugar of the opposite color. (DIY) They were stuck into the cans and natural kraft shred was filled into the can. 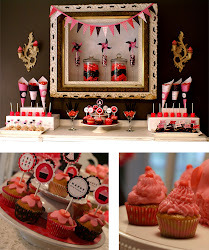 - We found cherry red hat boxes at Ikea and tiered them on the sides of the dessert table to act as the cupcake stands. - Cupcakes were adorned with pinwheels that we made using our patterned papers in our collection. 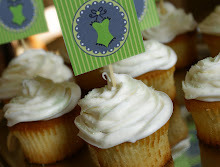 The cupcakes also had a solid white wrapper (from Bella Cupcake Couture) that was embellished with a printed party logo. - The “All American” caramel apples were sitting on top of the cupcake tiers with a printed party flag. The apples were beautifully drizzled with red and light aqua chocolate (made by Pretzels Pleaze). 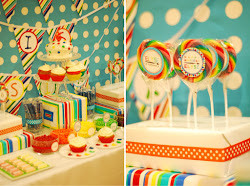 - Cookie pops (by Oh! So Yummy) were made to look like pinwheels in our bright aqua, red and navy colorway. She used homemade fondant on the cookies and they were DELICIOUS! The cookies were stuck into long glass containers that we filled with red M&Ms and had a thick navy/white ribbon wrapped around. - We lined white flat trays with red chocolate sunflower seeds and made white chocolate covered strawberries dipped in aqua sanding sugar (DIY)- perfect to tie into the theme of “red/white/blue” and “summertime”. We stuck a natural toothpick with a printed party flag into the tops of the strawberries for a festive look. 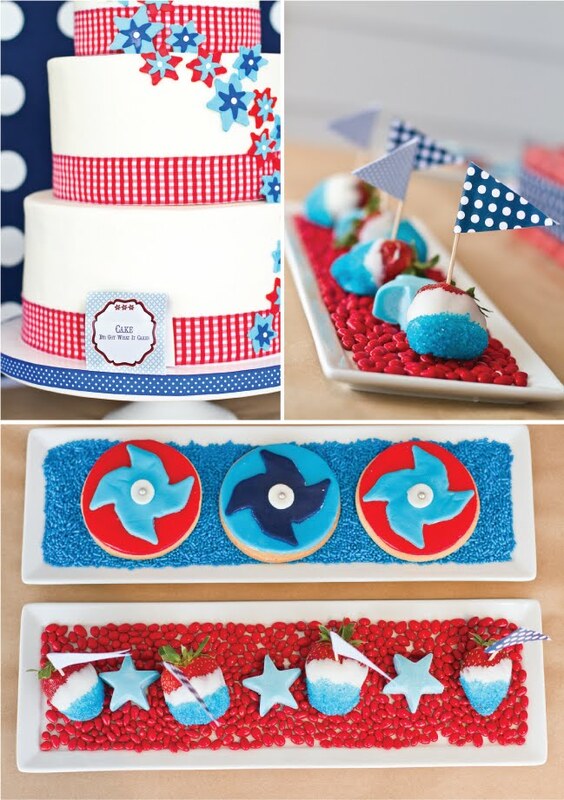 - Red/white/blue chocolate pretzels were also displayed in the center of the table on a bed of aqua non perils. 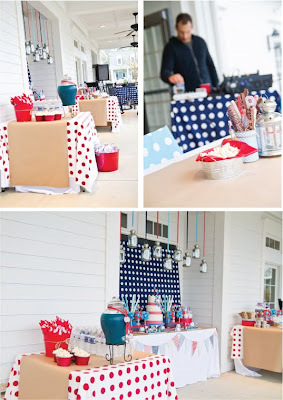 - We had two tables with red/white modern dot fabric tablecloths on each side of the dessert table. 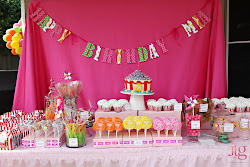 - One side table held all of our beverages including aqua lemonade in a glass dispenser. 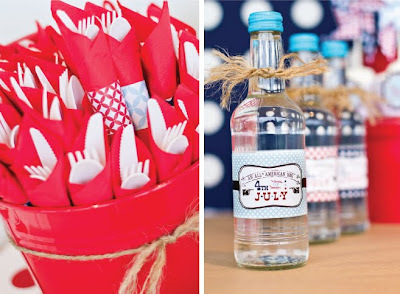 We also found perfect glass bottles with sparkling water and aqua metal lids. 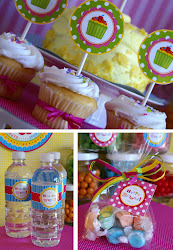 We tied twine around the necks of the glass drink bottles and wrapped with our printable drink wrap. 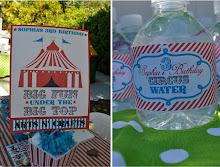 - Drink wraps were added to our water bottles and displayed on the kraft paper overlay. 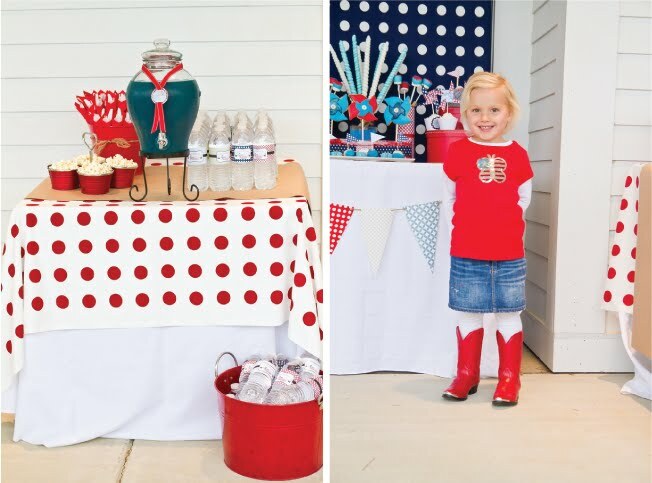 - Popcorn was displayed in a red galvanized container as well as wrapped napkins with our printable pattern paper wrap to tie in the patterns from the collection. 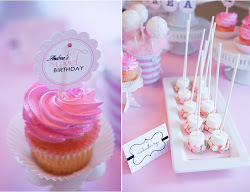 - The second side table held another display of treats and favors. - Here we displayed more cupcakes in a red galvanized tiered stand. 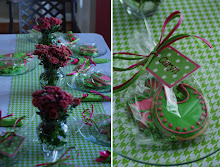 - Pinwheel cookies in M&M filled vessels were displayed along with bagged cookies for the guests to take home. 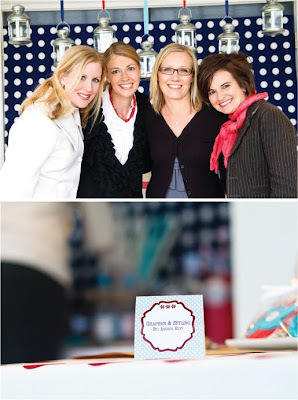 - We displayed kraft paper coffee bags (Nashville Wraps) with a clear window for the guests to fill up with treats to take home. - White chocolate stars were displayed with some fondant pinwheel embellishments. - Favor tins with clear tops (Nashville wraps) were filled with red, white and aqua candies and wrapped with twine. 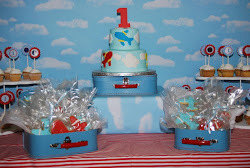 A printed party logo was displayed on the top of the container. 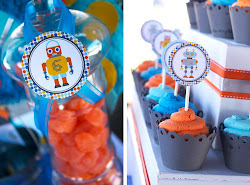 The kids were so excited to take treats home from the party. 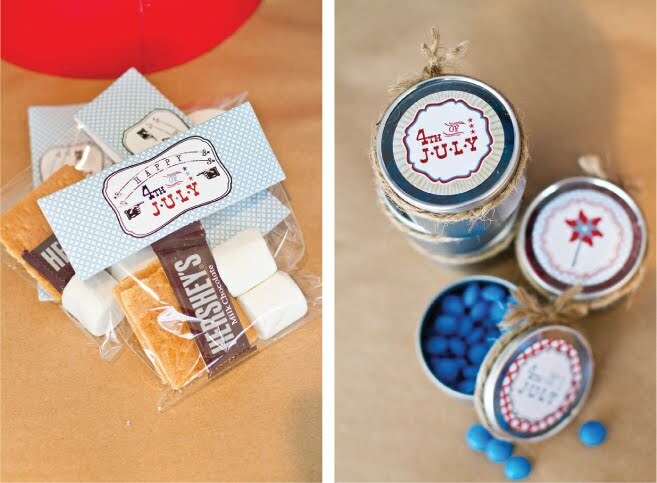 - (DIY) Smores kits were made for all of the guests to take and enjoy in the fire pit. we wrapped up hershey bars, marshmallows and graham crackers in a cellophane bag (Nashville Wraps) and topped it off with a printable bag topper from our collection. 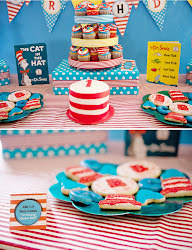 The kids LOVED this! 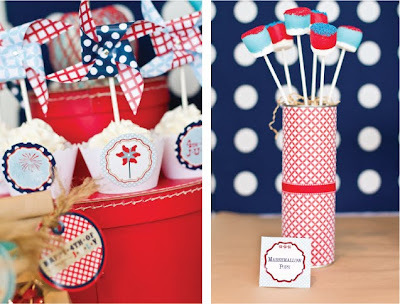 - (DIY) We had sparklers and matches that were embellished to coordinate. 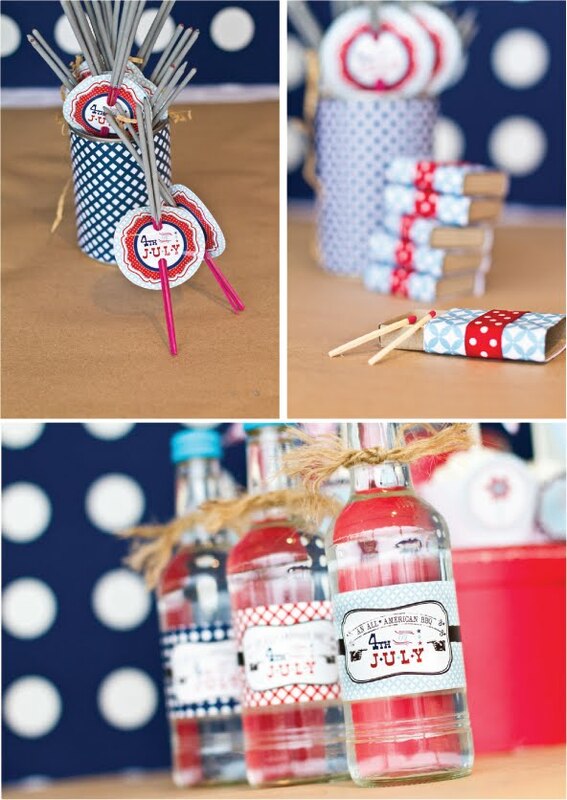 Our collection includes a Sparkler insert that the sparklers were inserted into for easy display. We wrapped the match boxes with printed pattern paper and ribbon. 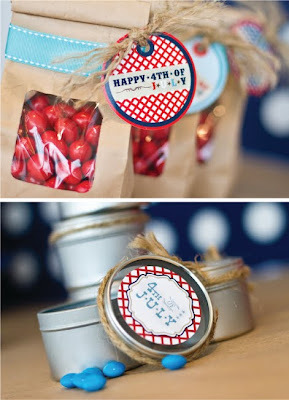 These were also displayed in the patterned paper wrapped soup cans. 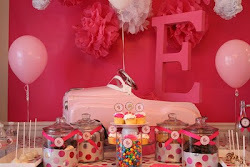 - We displayed our tables to coordinate with the dessert and accent tables. - White tablecloths with the kraft paper runner were shown on all tables. 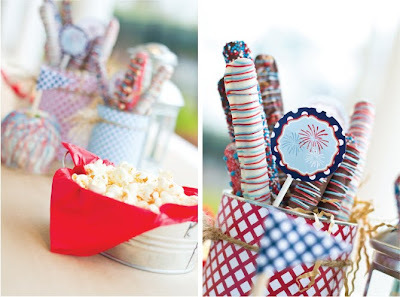 - The centerpieces consisted of patterned paper wrapped soup cans (DIY) that were filled with the chocolate dipped pretzel rods inside natural kraft shred and tied with a twine band. 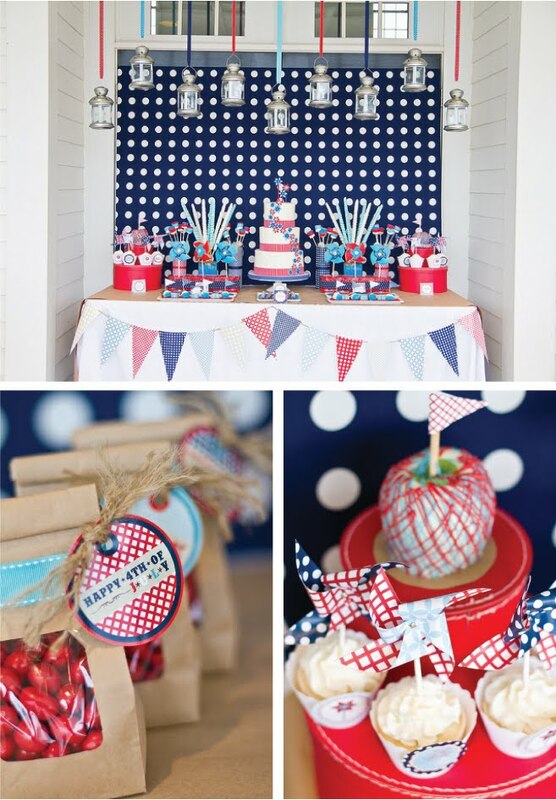 Chocolate apples with printed flags were also shown. 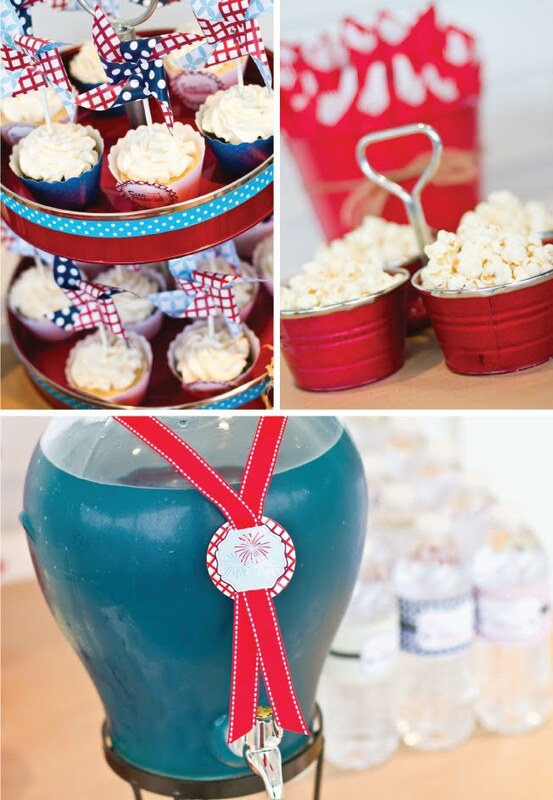 - Galvanized tins were filled with red tissue and popcorn. 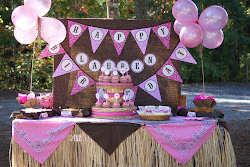 The guests had a blast and enjoyed food (Outback Steakhouse brought a grill to make ribs, chicken and hot dogs!) 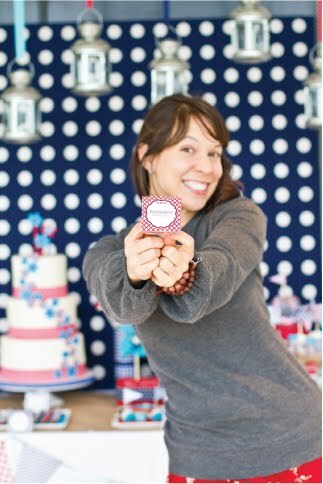 and music that was DJ’d by Caryn’s husband, Andy. 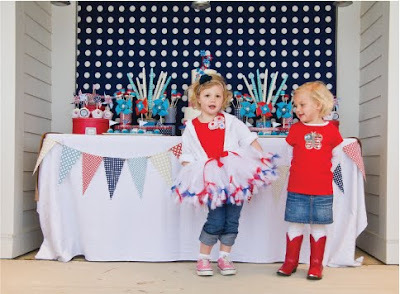 The guest of honor enjoyed dressing up in an adorable red/white blue outfit (tutu and tank from Sweet Things, hair accessory from Tadpole and Lily) and loved modeling for the camera with her friends that were also in red/white/blue. 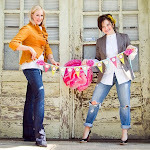 is available in our shop for 50% off until June 26th! 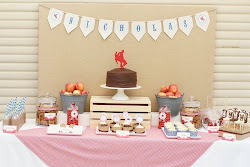 I am swooning over the covered apples...ridiculously cute!!! 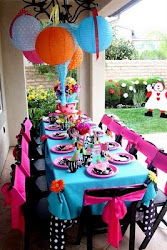 I want this table at my 4th of July BBQ! 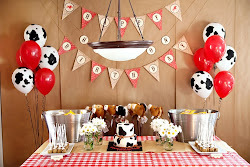 This is such a great party and I love the printables! 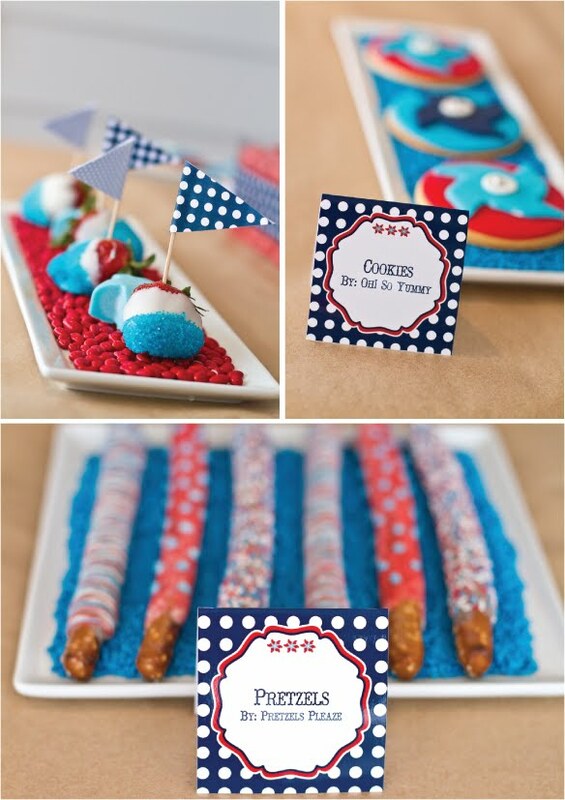 The details on the sparklers and matches are such a great touch for the 4th! 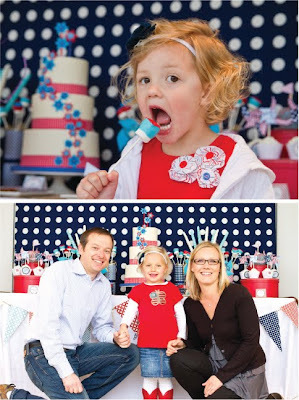 Where did you get the navy back drop and the tablecloths? 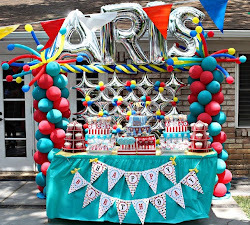 Such a great party! Строительство жилых и индустриальных многоуровневых объектов влечет за собой привлечение особой строительной техники, снабженной для осуществления конкретных задач. Проведение строительных работ происходит по стадиям, в связи, с чем, задействовать строительную технику тоже доводится по шагам, в зависимости от назначенных задач. Но покупка таковой специальной техники влечет огромные затраты. Поскольку стоит она дорого, компания "Сапрос" рекомендует предложение аренды строительной техники. Наш автопарк укомплектован всем надобным для строительства автотранспортом. Моментальный заказ спецтехники можно создать через интернет, заполнив заявку онлайн на сайте компании. В Самаре мы пользуемя популярностью именно за качественное и быстрое обслуживание заказчиков, предоставляя такую услугу, как аренда экскаватора. Наши специалисты при необходимости в полном объеме проконсультируют Вас о более подходящем под запросы автотранспорте, что позволит сэкономить и время и финансы. Кабельная продукция - один из основных продуктов, используемых для полнофункциональной работы электрооборудования. Большой объём разных моделей и марок кабеля на сайте ООО "Спецкомплект" предоставляют широкий выбор для оптового и розничного покупателя. Компания предлагает массу качественных товаров, таких как НЛ, К1160, К1161, К1162, силовой кабель ВВГ, ВБбШВ, СИП, АСБ, ENSTO арматура СИП, ОПТИЧЕСКИЙ КАБЕЛЬ КТ, ОКП, ОКГТ. 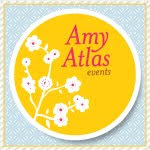 me how to subscribe your blog? 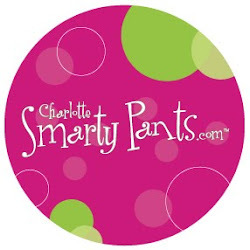 I for all time emailed this blog post page to all my contacts, as if like to read it afterward my friends will too. are supposed to be shared across the internet. 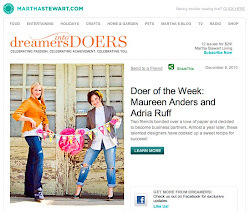 Shame on the seek engines for no longer positioning this post higher! 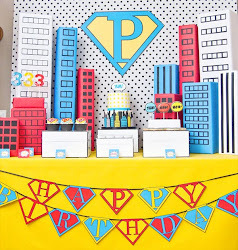 A Client Super Hero Party!